Wheels That Won The West® Articles - National Treasures – shared some photos of a couple of early wagons she had come across. Well known throughout the U.S., Christensen has a knack for locating unique vintage vehicles. These two were certainly no exception and we’re grateful to have the opportunity to review them here. The first is a heavy eastern-made wagon. Clearly built for freighting heavier loads, the lower box carries blue-tone paint applied many years ago and the gear still retains a good deal of its original carmine red coloring. Hand forged hardware dominates both the gear and the box. As with virtually all early pieces, the heavy side and end boards appear free of knots and imperfections. The upper or “tip top” boards may have been attached at a later date and, correspondingly, do show some minor natural blemishes in the wood. Bolted metalwork reinforces the lower box corners while the upper side and end board are connected with unique quick-release iron clips instead of the more traditional box rods. The endgate at the back of the box folds down and does not automatically disengage itself as other heavy farm wagon styles often do. Overall length dimensions also go beyond those of a typical farm wagon. The box length is 14 feet and the width measures 42 inches. Tire width is 4 inches and wheel heights top out at 40 inches up front and 47 inches on the rear wheels. The through-bolted gear construction includes extension skeins for optimum support of each axle. 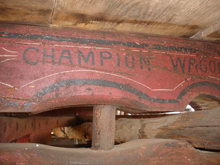 Looking closer at the gear, the back of the rear axle sports an early maker mark for the Champion Wagon Company in Owego, New York. While the insignia is crude by modern standards, the stiff tongue gear is a solid match to original Champion literature in our archives. From the front and rear hound designs to the bolster standards, rear brake, gear brake, ironwork and all, the gear is a clear example of what Champion referred to as its “Berks County Gear”. As a side note, Berks County, Pennsylvania is well noted for its early use and construction of Conestoga freighters and that influence is easily seen in the ironwork of this reinforced gear. Established in the late 1880’s, the Champion Wagon company was one of a number of wagon makers that recognized the future of transportation and tried to transition to the manufacture of automobiles. In fact, by 1902 – well ahead of the formation of General Motors, Chevrolet, Dodge and others – the company is reported to have built a prototype auto. Unfortunately, they were never able to establish enough financial support to sustain their entry into motorized transport. They built wagons up until they went out of business in the early 1920’s. In addition to wagons, they also made light and heavy vehicle bodies for farm trucks, ambulances, hearses and other businesses. Christensen’s photographs of the second wagon show another rare vehicle with even stronger Conestoga design influence. That said, this set of wheels is not a Conestoga freighter by strict definition. Instead, it is closer to what is typically referred to as a Conestoga-styled farm wagon… albeit a very brawny farm/freight wagon. In addition to being a well-preserved example of a heavier 1800’s transport, this wagon gives us an excellent opportunity to explore key differences between the large Conestoga freighters of the 18th and 19th centuries and similarly-built work wagons employed in the latter part of the 1800’s. 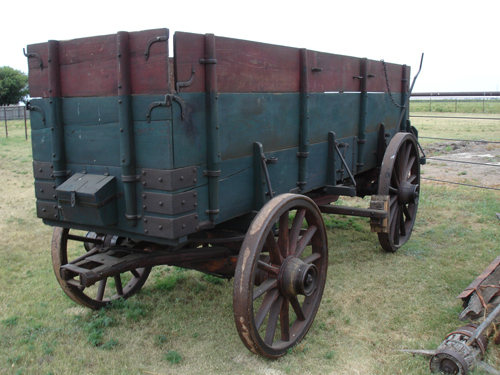 While this wagon has many features that are comparable or even identical to a typical Conestoga freighter - i.e. toolbox, chipped edge endgates, lazy board, feedbox support chains, rings for rough locks and other features - it also has key differences that help place its manufacture later than the 1750-1850 era spanned by most Conestoga wagons. Whereas a Conestoga freighter generally possesses between 8-12 bent wooden bows along with corresponding iron bow staples, this wagon has had the bows and staples added more recently. Also, the primary side panels of a Conestoga tend to have a much more pronounced upward rake or curve at each end. Additionally, Conestoga gears typically possess larger wheels, with rear wheels measuring at least 54 inches in diameter. 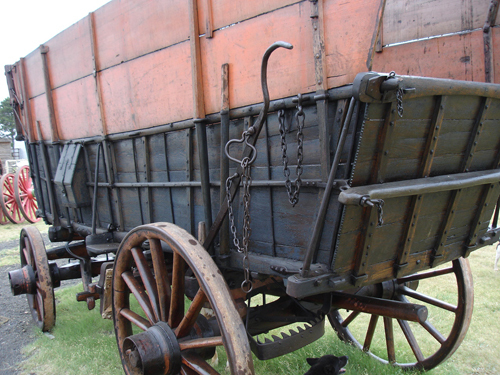 While not all Conestoga wagons had mechanical brakes, some did have a brake with a lever on the left side as this wagon does. 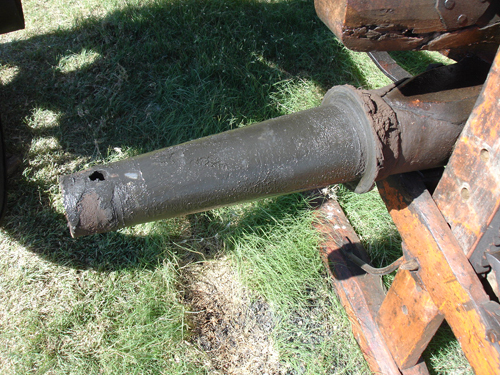 However, principle experts agree that no Conestoga wagon would have had a later style rear gear brake as original equipment such as this wagon shows evidence of having at one time. Additionally, the ironwork on the toolbox possesses less of the ornate artwork often employed with a Conestoga and is more utilitarian in nature - again indicating a later manufacture date. The lack of - or presence of - these specific features in is no way a downgrade to the value of this vehicle. The information merely helps point us in the direction we need to look for more accurate provenance and identification. Interestingly, the axles on this wagon make use of thimble skeins. These metal shrouds enclose the ends of the wooden axle and serve as the “bearing” or surface that the wheel hub rolls on. These specific skeins are actually an early variation of what we would refer to as an extension skein on a 20th century farm wagon. In contrast, wooden axle wagons – especially a Conestoga – produced prior to the mid 1850’s commonly used strips of metal on the top and bottom of the axle ends called “clouts.” These smaller strips of metal can also be called skeins but clearly do not cover the entire axle end and are not thimble skeins. That said, the types of skeins on this gear aren’t commonplace among surviving wagons today. Instead of using a threaded nut on the end of the skein to hold the wheels on the axles, a linchpin (similar to a cotter key) is fitted through a slot on the end of each axle. 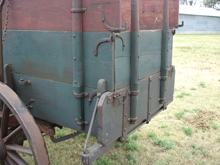 While this feature can be indicative of wagons built prior to the Civil War, there were several companies building wagons in the late 1800’s that offered thimble skein wagons with a choice of either threaded nuts or linch pins on the axles. One company that did so was the George Nissen wagon-making firm in Salem, North Carolina. 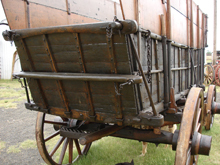 When it comes to this particular wagon, the straighter bed, lack of original bow staples, existence of a rear gear brake, thimble skeins on the axles and the use of smaller wheels are among the features that contribute to us labeling this wagon as a “Conestoga-styled” farm/freight wagon with definite Pennsylvania Dutch influence. The heavier bracing, thicker tires, extension skeins, and extra bolts tying together the rear axle and bolster as well as the front axle and sandboard all indicate this vehicle was built to haul heavier loads. Later 20th century wagon builders would generally abandon this through-bolting process and manufacture what they called “clipped gears.” The “clips” are actually large U-bolts designed to support the pressures applied to the bolsters, sandboard and axles. While the complete wagon (box & gear) is not a Conestoga freighter in the strictest sense of the definition, clearly this vehicle is built with a strong Conestoga influence. The gear is separated most from a Conestoga definition because it has axles with thimble skeins. The box is likely older than the gear and, on its own merits, is a much closer match to Conestoga design standards. Each piece is well over a century in age and exceptionally well preserved. 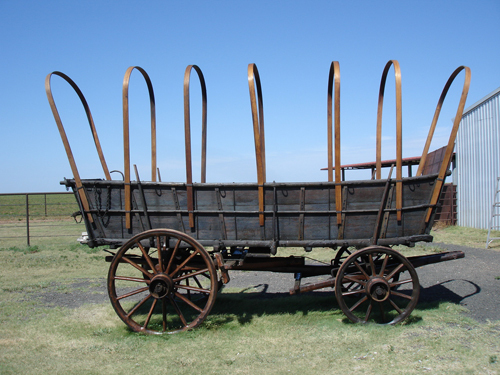 Interestingly, both the Champion wagon and this Conestoga-styled farm wagon started their life in the east and, just like many of their ancestor vehicles, they have gradually migrated west. Today, these particular wagons reside in a vehicle collection in Arizona. Far from their birthplace, they stand as impressive reminders of the strength, vision and raw will required to not only build a nation, but inspire the world. Kathy Christensen and Midwest Buggy in Lockney, Texas are dedicated to locating unique western vehicles for a wide variety of clients including museums, private collectors, the motion picture industry and chuck wagon enthusiasts. Christensen can be contacted at info@midwestbuggy.com or call 1-806-652-1313.